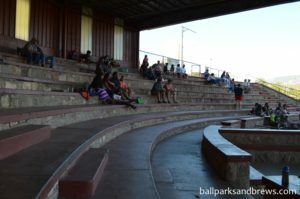 Ballparks Basics: Life ain’t easy in the Pecos League*, but these guys make it look good! The Pecos League is an independent league created in 2011 that had teams mainly in New Mexico and West Texas. 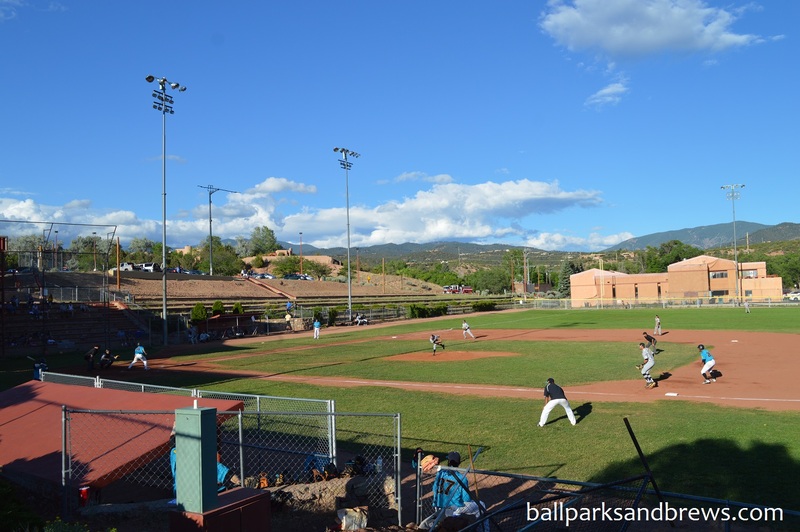 The league has since expanded to include teams in Colorado, Arizona, Kansas, and California. The Santa Fe Fuegos started in 2012 and moved into the Fort Marcy Ballpark. Fort Marcy Ballpark was built in 1936 as a WPA project and there is a carving into the stone façade between the backstop and grandstand to commemorate this. 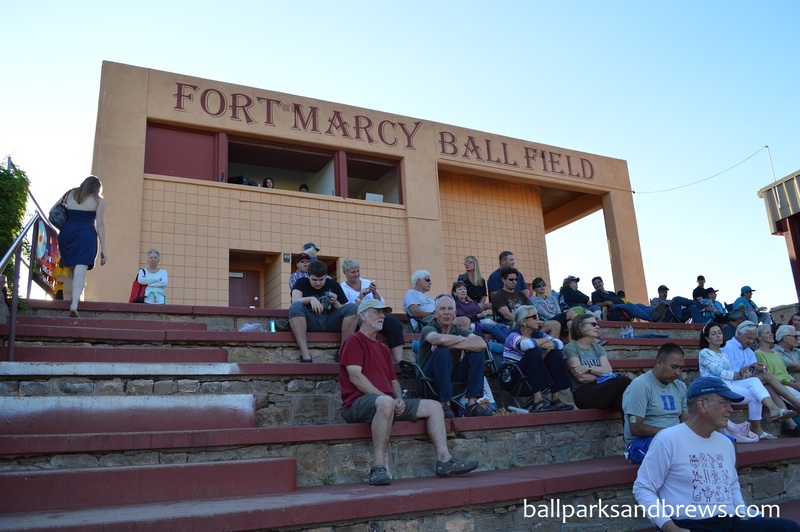 The ballpark is a part of Fort Marcy Park and offers great views of Santa Fe. Fort Marcy was built in 1846 by the U.S Army to help solidify their presence in New Mexico. 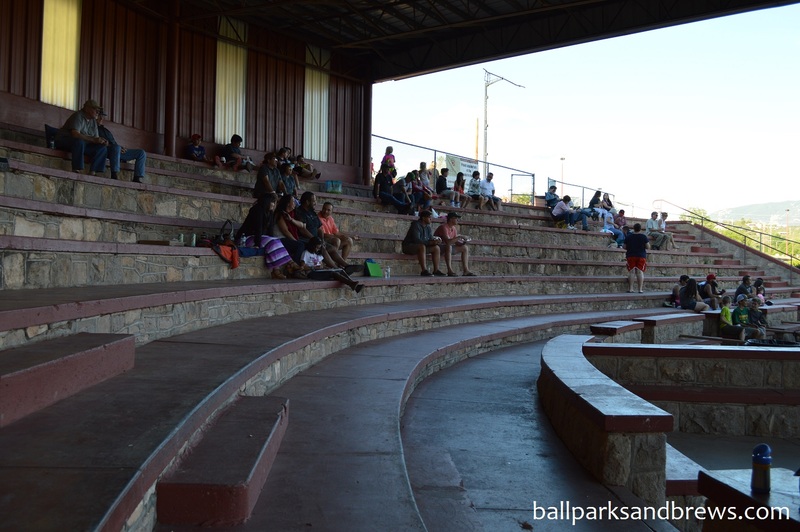 The grandstand is made of wide stone and concrete steps with amphitheater-style seating. Most of the fans brought their own chairs to sit on while a few people just sat on the end of the steps. The park does have “box seats” that are fenced off in the front row as well as a large pit that is directly behind home plate. A roof covers about half of the seats in the grandstand. The crowd was extremely active during our visit with chants, and heckling of the umpires throughout the game. The biggest fan that we noticed had set up shop outside of the paying attendance with a chair along the chain-link fence and was following every pitch with anticipation. 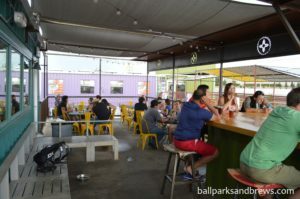 Best Spot for Beer: A large cinder block building sits next to the grandstand along the first base side and houses the pressbox, concession stand, and bathrooms. Here you will find a sampling of the usual suspects but they had some options from Santa Fe Brewing Co. Baseball is not the only draw to Fort Marcy Park. Labor Day weekend the park becomes home of one the most unique celebrations in the country, let alone Santa Fe: the annual burning of Will Shuster’s Zozobra. Makes us want to return for a visit this fall! *Opinion based on our review of another Pecos League team, the Trinidad Triggers, and info about life in the Pecos league as part of a Fox Sports 1 6-part documentary. Beer Basics: A true oasis in the desert. We actually couldn’t fit in a stop to Santa Fe Brewing until we hit Albuquerque, but it ended up being our favorite brewery coming out of Santa Fe, and so though the buildings differ (the pictures you see are the Albuquerque location) but the beers are just as delicious in either city. 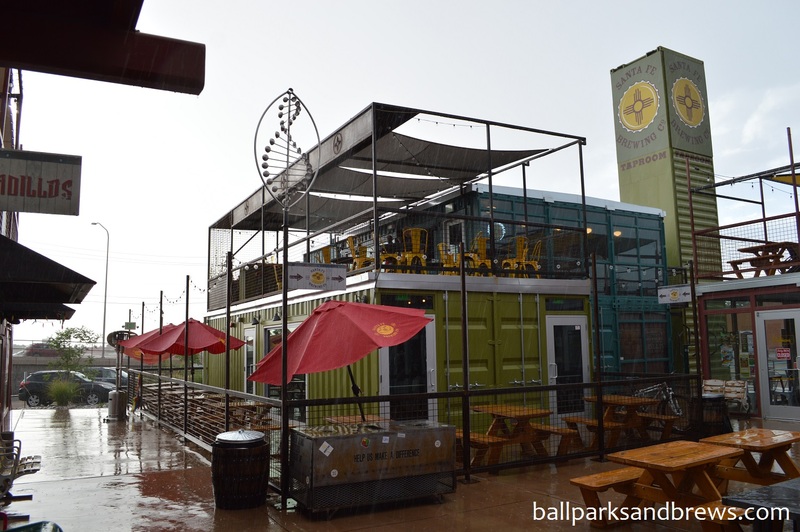 The ABQ location was at the top of a small, modern complex with locally sourced food and a (yoga) studio and was once of our first experiences in the current trend of repurposing shipping containers. A stark contrast to the desert, this bright green complex is all concrete decks, metal railings, and windows for days. We started out on the upstairs deck, which had lots of seats and a bar of its own. 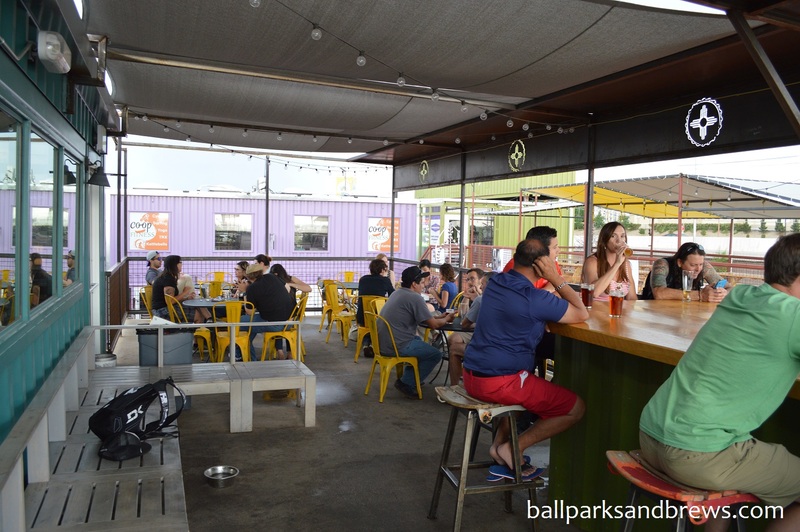 When we were hit with a quick summer storm, the canvas tarps providing shade proved to have just a few too many imperfections to keep us dry, so we were able to move indoors and grab a bar stool up against some of the big picture windows. The other tables, windows and upstairs darts and pool tables, and attentive waitstaff made for a busy, fun scene. Downstairs at the foot of the staircase you can turn one direction to get to another bar, or the other to get to a double sized dining room. 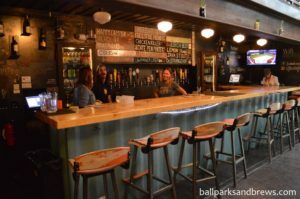 Beer Breakdown: They’ve got multiple bars, a large chalkboard with all of the offerings, and descriptive menus describing the ever rotating list. Bartenders and wait staff we interacted with were all able to provide pointers, accurate descriptions, and samples as needed. Nuevo 4.6% ABV/ 10% IBU – From the description and light appearance we expected this to taste like a Corona, but it was more like a slightly spiced lager. It was still very light but not like “this needs a lime”. Cherry Cider – Pink like a blush wine, smells like sour cherry but wasn’t a sour beer. Was refreshing and the added cherry added a tartness to the beer that was a compliment to the palate by cutting some of the cider sweetness. Nut Brown 5.2% ABV/ 35 IBU – Mahogany brown, effervescent, smooth, mild and light. The aroma is that of rounded malts with a lot of carmel in body and end. State Pen Porter 6.4%ABV/ 50 IBU – Cola colored beer that starts light, builds chocolately and then has pepper and coffee in the end. Black IPA 7.1%ABV/95 IBU – This beer smells hoppy but is actually quite balanced and clean. Hoppy profile for the palate and a big foamy head on this brown colored, Black IPA.